Paul Stockton, Current Managing Director and Former Assistant Secretary of Defense for Homeland Defense and Americas’ Security Affairs, Sonecon, LLC, outlined what he sees as threats to the electric grid and fuel supplies to power generators and why nuclear generation is more resilient against attack. “While China, Russia, and other nations are developing increasingly sophisticated cyber weapons to attack U.S. energy infrastructure, the two key components of the energy sector [nuclear power and the Oil and Natural Gas] are taking radically different approaches to defending against that threat. ‘The electricity subsector must comply with increasingly stringent, mandatory standards for both cyber and physical risks. Nuclear power plants must meet especially demanding security requirements – and therefore offer extraordinary value for resilient electric service. “But the Oil and Natural Gas (ONG) subsector lacks mandatory standards. “Moreover, the Nuclear Regulatory Commission (NRC) provides nuclear plants with a design basis threat (DBT) to help plant owners and operators understand the scale and severity of the attacks they must be prepared to counter. Stockton said critical electric distribution facilities like substations and natural gas compression facilities are vulnerable to physical attacks by truck bombs or other means to create massive physical damage. As an example, he pointed to a 2013 attack on the Metcalf electric substation in San Jose, California which knocked out 17 or its 23 transformers. 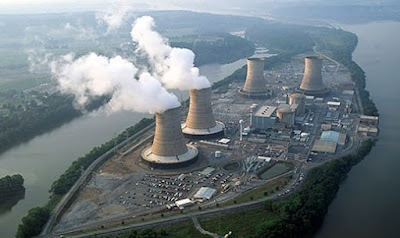 “Nuclear power plants are heavily protected against all such cyber and physical threats. Nuclear power plants, under NRC regulation, have mandatory physical and cyber standards. These standards are in part derived from the NRC’s design basis threat (DBT) for nuclear power plants and related facilities. “A successful attack on natural gas utilities in regions of the U.S. that are particularly reliant on this source of fuel would immediately hinder the electricity subsector’s ability to generate power and could cause electric outages – potentially exacerbated by physical damage to gas infrastructure. “In contrast, nuclear power plants rely on onsite fuel for power generation and can generate electricity for many months between refueling operations. “Natural gas explosions in Massachusetts on September 13 highlight the potential risks of adversary intrusions into natural gas system control networks. “While there is no evidence to suggest that these explosions or the over-pressurization in pipelines that caused them were the result of malicious intervention, these actions exemplify the type of actions that adversaries could take to disrupt natural gas supplies for power generation and cause kinetic damage in the U.S.
“If an adversary were able to infect a natural gas utility’s industrial controls they could similarly cause gas lines to over-pressurize and explode, leading to both structural damage to customers and destruction of the pipeline infrastructure that allows gas to flow to power generators. Stockton said the U.S. Transportation Security Agency must adopt mandatory security standards for the oil and natural gas sector. "Cyber and physical protections in the ONG subsector remain voluntary despite repeated pressures to introduce mandatory standards. Both TSA and the pipeline industry defend this voluntary approach by arguing that many companies currently exceed the voluntary guidelines, and that setting general standards would create requirements less stringent than what is common practice across much of the subsector. “Others suggest that government-issued standards, by nature, cannot keep pace with the evolving threat. This rationale may no longer be sufficient for a threat landscape in which the consequences of a lapse in security could cascade across multiple critical infrastructure sectors, nationwide. “Mandatory standards – paired with an effective enforcement mechanism and sufficient TSA resources to ensure compliance – could bolster the defenses of companies who do not currently meet the voluntary measures. “I [also] recommend that you take steps to halt the premature retirement of nuclear power plants and ensure that energy market prices compensate nuclear plants for the resilience and environmental benefits they bring to customers – and value for national security they provide as a result. Edward McGinness, Principal Deputy Assistant Secretary, Office of Nuclear Energy, U.S. Department of Energy, said nuclear energy is one of the most reliable source of electric generation working 24/7 without refueling. In Pennsylvania it accounts for more than 40 percent of the electricity generated in the state and 93 percent of the carbon-free electric generation. The generation capacity of just the three nuclear power plants scheduled for shutdown in Pennsylvania is equal to the all the wind and solar energy generation in the regional PJM Interconnection. McGinness said DOE is working on a number of initiatives on nuclear power, including accident tolerant fuels, extending the life of number plants to 80 years and advanced nuclear power plant designs, including “walk-away” safe designs. Amy Roma, Partner, Hogan Lovells and Co-Author, Back from the Brink: A Threatened Nuclear Energy, noted several connections between U.S. military nuclear programs and the commercial industry. One major connection is that personnel trained in the military often seek job opportunities in the commercial nuclear industry. If the commercial industry is not there, it represents a significant loss of expertise and opportunities to the economy. Sen. Ryan Aument (R-Lancaster), one of four co-chairs of the Caucus, said the group will be publishing a report outlining possible options for the General Assembly to take to prevent the premature closure of nuclear power plants based on what the Caucus has learned in its hearings. In response to a question from Sen. Aument about federal versus state roles in dealing with this issue, Amy Roma said states have a “huge role to play” in helping to keep nuclear plants from closing. She cited the example of Illinois which adopted a zero emission credit program to properly value the benefits of power from nuclear power plants. Click Here for a copy of written testimony and a video of the hearing (when posted). Senators Ryan Aument (R-Lancaster) and John Yudichak (D-Luzerne) along with Representatives Becky Corbin (R-Chester) and Rob Matzie (D-Allegheny) serve as co-chairs of the Nuclear Energy Caucus. For more information on this and past hearings, visit the Nuclear Energy Caucus webpage.